As per intelligence inputs received on 31st December, a fishing boat from Keti Bunder near Karachi was planning some illicit transaction in Arabian Sea. Based on the input, Coast Guard Dornier aircraft undertook sea-air coordinated search and located the suspect fishing boat. Thereafter, the Coast Guard ship on patrol in area was diverted and intercepted the unlit boat at about midnight of 31st December in position 365 km West-South West of Porbandar. Coast Guard ship warned the fishing boat to stop for further investigation of the crew and cargo; however, the boat increased speed and tried to escape away from the Indian side of maritime boundary. The hot pursuit continued for nearly one hour and the Coast Guard ship managed to stop the fishing boat after firing warning shots. Four persons were seen on the boat who disregarded all warnings by the Coast Guard ship to stop and cooperate with investigation. 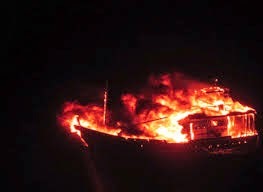 Soon thereafter, the crew hid themselves in below deck compartment and set the boat on fire, which resulted in explosion and major fire on the boat. Due to darkness, bad weather and strong winds, the boat and persons on board could not be saved or recovered. The boat burnt and sank in the same position, in early hours of 1st January 2015. Since the boat sank, Coast Guard ships maintained continuous presence in the area for recovery of any survivors, dead bodies or debris from the boat. Coast Guard Dornier aircraft also searched the area, however, no survivors, dead bodies or debris from the boat could be found in the area. Post interception of the boat on 1st January, 2015, ICG, has been maintaining strong presence in the area, through regular and continuous surface and aerial surveillance, so as to deny any subsequent attempt by adversaries to enter our maritime zones. Coast Guard ships from Gujarat along with Dornier aircraft from Porbandar and Daman have been maintaining regular surveillance in area off Indo-Pak IMBL. Bigger ships from Mumbai also join the operation regularly for force augmentation. In addition, patrolling close to the coast has also been strengthened by deploying Interceptor Boats, Interceptor Crafts and Air Cushion Vehicles (ACVs). This information was given by Defence Minister Shri Manohar Parrikar in a written reply to Shri Rajkumar Dhoot in Rajya Sabha today. As per allocations proposed under BE 2015-16, defence budget constitutes 13.88% of total Central Government expenditure. In the last 15 years, Defence expenditure has never been less than 12% of total Central Government expenditure. The liability of the Government for repayment of interest is a separate obligation that may not be linked to the outlay for defence. The government does not have authentic figures for the defence budget of China. However, Stockholm International Peace Research Institute (SIPRI), has estimated that in 2013, 8.3% of China’s general government expenditure was devoted to military expenditure. The allocation of funds for defence is made to ensure full preparedness of the armed forces to meet all security challenges to the country. The government has revised the FDI policy to allow FDI upto 49% in defence sector through Government route and above 49% through approval of Cabinet Committee on Security, on case-to-case basis, wherever it is likely to result in access to modern and state-of-the-art technology in the country. This information was given by Defence Minister Shri Manohar Parrikar in a written reply to Shri Vishambhar Prasad Nishad in Rajya Sabha today. The details of the laboratories / units functioning under Defence Research and Development Organisation (DRDO) alongwith their locations and areas of research are given at Annexure ‘A’. With effect from Financial Year 2014-15, adequate funds are being made available by the Government, though earlier DRDO had faced shortage of funds. Provisions have been made in Defence Procurement Procedure, 2013 to encourage indigenous defence products. This information was given by Defence Minister Shri Manohar Parrikar in a written reply to Dr. T. N. Seema in Rajya Sabha today. The functioning of Defence Research and Development Organization (DRDO) was reviewed by a Committee headed by Prof. P. Rama Rao. DRDO has accepted several recommendations which inter-alia include creation of Seven Technology Domain based Clusters headed by Director’s General; Restructuring of DRDO HQrs; Creation of Directorate of Quality, Reliability and Safety (QR&S); increase in budget for Extramural Research; creation of empowered Defence Technology Commission (DTC); creation of a Commercial Arm of DRDO; creation of 5 Senior Administrative Grade (SAG) posts along with 162 other posts for full scale implementation of Integrated Financial Advisor (IFA) Scheme etc. This information was given by Defence Minister Shri Manohar Parrikar in a written reply to Shri Rajeev Chandrasekhar in Rajya Sabha today. This information was given by Defence Minister Shri Manohar Parrikar in a written reply to Shri Mani Shankar Aiyar in Rajya Sabha today. Subsequent to the Initial Operational Clearance (IOC) of Light Combat Aircraft (Tejas), Hindustan Aeronautics Limited (HAL) has handed over the First Series Production (SP1) of Light Combat Aircraft (LCA) to the Indian Air Force (IAF) on 17.1.2015. The requirement of fighter aircraft is periodically reviewed and it is ensured that the operational requirements of the IAF are met. The IAF is in the process of inducting additional Su-30 MKI aircraft apart from Light Combat Aircraft (LCA). An Inter-Governmental Agreement has been signed with Russian Federation for design, development, production etc. of a Prospective Multi Role Fighter Aircraft. The procurement of Medium Multi role Combat Aircraft (MMRCA) is also under process. New advanced aircraft inducted by the Indian Air Force (IAF) in the recent past include Su-30 MKI fighter aircraft, C-17 and C-130 transport aircraft, Mi-17V5 and ALH helicopters along with Pilatus PC-7 Basic Trainer and Hawk Mk-132 Advanced Jet Trainer. Further, recently on 17th December, 2014, the first Light Combat Aircraft has been accepted by the IAF. In the case of Army, 5 number of Advanced Light Helicopter (ALH) Dhruv have been taken over during the last one year. Submarine / vessels commissioned during the last one year by the Navy include INS Sumedha, INS Sumitra, INS Kolkata, INS Kamorta and three Immediate Support Vessels (ISV). This information was given by Defence Minister Shri Manohar Parrikar in a written reply to Shrimati Sarojini Hembram in Rajya Sabha today. India and USA have finalised the new Framework Agreement on Defence Cooperation which would replace the existing Framework Agreement on Defence Cooperation expiring in June 2015. A dialogue has been established between both countries under the Defence Technology and Trade Initiative (DTTI) for co-development and co-production of unique and exceptional technologies of mutual interest. Defence cooperation with US continues to be pursued on the basis of mutual interest and convenience. This information was given by Defence Minister Shri Manohar Parrikar in a written reply to Shrimati Sasikala Pushpa in Rajya Sabha today. Out of a planned length of 8.80 km of the tunnel on Manali-Leh road, 4.807 km has been completed covering 2.245 km from Manali side and 2.562 km from Leh side. Encountering of Seri Nallah Fault Zone at the South Portal. Variation between tendered rock class and encountered rock class. So far 441 m excavation has been done in Seri Nallah Fault Zone from Manali side with innovative technology. The revised estimated time for completion is August 2019. The expenditure incurred so far for construction of the tunnel is Rs. 1036.87 crores against an allotment of Rs. 1040 crores. This information was given by Defence Minister Shri Manohar Parrikar in a written reply to Shri A. U. Singh Deo in Rajya Sabha today. The norms for R&D, as per the guidelines of Department of Public Enterprises, are a minimum expenditure of 1% of Profit After Tax (PAT) for Maharatna & Navratna categories of Central Public Sector Enterprises (CPSEs). In respect of other CPSEs, it is 0.5% of PAT. All profit making Defence PSUs are complying with DPE norms for R&D expenditure. The data about R&D expenditure by foreign countries is not maintained. The Government provides assistance to Indian Industry/DPSUs/OFB/consortia in Research and Development of defence equipment. Under the ‘Make’ Category of Defence Procurement Procedure, there is a provision for funding 80% of the expenditure on Research and Development of prototype by the Government. Additionally, a Technology Development Fund (TDF) was announced in Union Budget 2014-15 to provide necessary resources to public and private sector companies, including SMEs as well as academic and scientific institutions to support Research and Development of defence systems that enhance cutting edge technology capability in the country. So far as DPSUs are concerned, in the MOU’s signed between Government and DPSUs, a certain percentage of turnover has been fixed towards expenditure on R&D. This information was given by Minister of State for Defence Rao Inderjit Singh in a written reply to Shrimati Sasikala Pushpa in Rajya Sabha today. (i) Technology Perspective and “Capability roadmap (TPCR), which gives out the equipment and technologies required by our Armed Forces, has been put in public domain to provide the industry an overview of the direction in which the Armed Forces intend to head in terms of capability over the next 15 years. (ii) Preference to ‘Buy (Indian)’, ‘Buy & Make (Indian)’ & ‘Make’ categories over ‘Buy (Global)’ or ‘Buy & Make’ categories of Capital Acquisition cases. (iii) The procedure for ‘Buy and Make (Indian)’ category, has been simplified in order to make the category more attractive for Indian Defence industry. (v) Indian private sector industry has also been allowed to receive Maintenance Transfer of Technology (MToT) in ‘Buy (Global)’ cases. *Increase in shortage is due to increase in authorized strength. Government has taken various steps to make Armed Forces jobs attractive. These include implementation of recommendations of the VI Central Pay Commission with improved pay structure, additional family accommodation through Married Accommodation Project (MAP) and improvement in promotion prospects in Armed Forces. Indian Coast Guard has a force level of 113 surface platforms including 50 ships, 45 Interceptor Boats & 18 Air Cusion Vehicles (hovercraft). In an expanding organization like the Coast Guard, procurement of vessels is an ongoing process. The acquisition of ships and boats are carried out keeping in view the threat perceptions, strategic concerns and operational requirements. There has been a significant acquisition of ships / vessels for Coast Guard in recent years. Indian Coast Guard has increased its fleet strength to 113 vessels and 64 aircraft compared to 61 vessels and 46 aircraft in 2008. Coast Guard has been adequately equipped to face the challenges of national security and the role assigned to it by Government. Further, Government attaches utmost importance to nation’s coastal security and surveillance. Review and monitoring of coastal security mechanism is a continuous process. Several measures to strengthen Coastal Security, including improving surveillance mechanism and enhanced patrolling by security agencies following an integrated approach have been put in place. Joint operational exercises are conducted on regular basis among Navy, Coast Guard, Coastal Police, customs and others. The intelligence mechanism has been streamlined through the creation of Joint Operation Centres and multi-agency coordination mechanism. Installation of radars covering the country’s coastline and islands is also an essential part of this process. Deployment of assets is done as per threat inputs / perceptions and requirements. This information was given by Defence Minister Shri Manohar Parrikar in a written reply to Shri Anubhav Mohanty in Rajya Sabha today. Modernisation of the Defence Forces is a continuous process based on threat perception, operational challenges, technological changes and available resources. The process is based on a 15 year Long Term Integrated Perspective Plan (LTIPP), Five Year Service Capital Acquisition Plan (SCAP) and an Annual Acquisition Plan (AAP). Procurement of equipment and weapon systems is carried out as per the AAP. Capital Expenditure on defence equipments during 2009-10 to 2013-14 was Rs.274005.99 crore. The contracts signed for procurements include those for missiles, rockets, ammunition and aircrafts. Government constantly reviews the security scenario and accordingly decides to induct appropriate defence equipment to keep the armed forces in a state of readiness and remaining equipped with modern weapon systems which is undertaken through procurement from various indigenous as well as foreign vendors.